Colleen, a patient at Niagara Health’s Welland Site, has spent the last two years on a ventilator, rarely being able to venture outside. Recently, Registered Practical Nurse Jeannine Russ helped bring the outside world in. 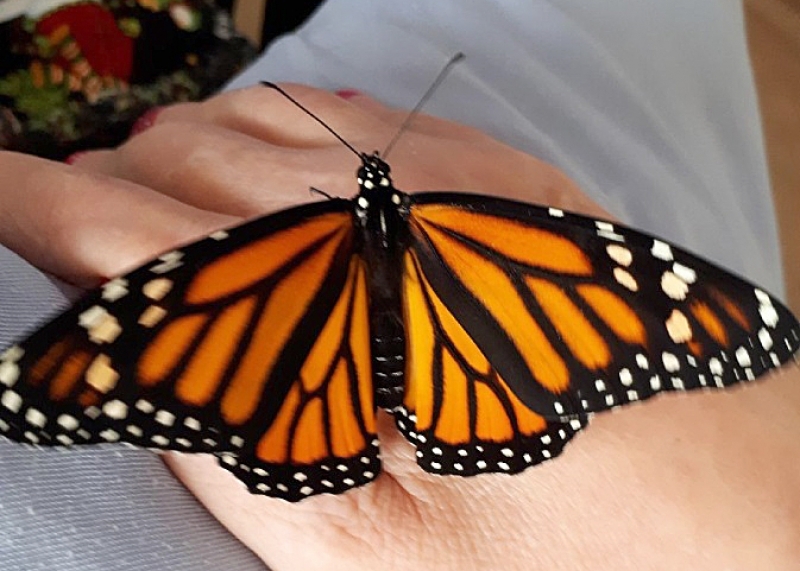 Earlier this month, Jeannine brought a monarch butterfly cocoon to the hospital for Colleen. Seeing the outline of a future butterfly inside, they knew that it would soon hatch. She set the cocoon up on the table next to Colleen’s bed, in anticipation. "You could see the cocoon wiggle and this dark shape really moving around inside," Colleen says. "I just sat and watched. It was amazing!" The actual emergence went quite quickly. Soon, Colleen had a new roommate: a monarch butterfly, hanging upside down, recovering from its morning’s work. Upon discovering that she was a female butterfly, Colleen named her "Justine," as in "just in time." Colleen was transfixed for two hours as Justine ate her cocoon and mustered up the strength to fly. Jeannine put Justine on her arm for another two hours, as the beautiful insect flapped its wings. "It tickles! I didn’t expect it to move around so much, but it felt fabulous," Colleen says. "It was so close. It was only about six inches from my face. Just having the pleasure to watch it all happen was amazing." "We tend to forget the little things, and how precious they are," Jeannine says. "Especially to patients who don’t get to experience them." Staff was aware of the hospital’s newest orange and black guest, so they dropped by often to congratulate Colleen on becoming a “grandma” again. Finally, it was time to set Justine free. They took a video so Colleen could see her new friend Justine fly away. "It makes me feel very welcomed," says Colleen. "It’s such a family atmosphere around here. You feel the compassion and the honesty of the nurses. You can tell them anything." Jeannine has also taken to decorating Colleen’s room for the season. When Colleen got a Christmas tree in her room, it also served as a nightlight. Jeannine has re-decorated that tree to mark Valentine’s Day, Easter and now summer. "There are a lot of people doing a lot of good things for patients here,” Jeannine says. "It’s just a matter of taking a step back and thinking what kind of care would I want, if it was me? What would that mean to me? "I’ve been very blessed, so I just want to pay it forward."